Home / brand new / brand new artist / música / Zach Callison / Zach Callison Unveils Debut Single "War!" Zach Callison Unveils Debut Single "War!" 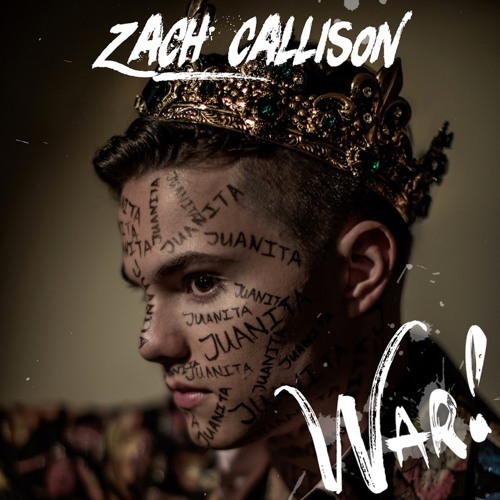 Los Angeles-based musician, voice actor, content creator, and actor Zach Callison has unveiled his debut single War!. Produced by Chase Ryan, Anthony Mazza, and Callison himself, the single is a dynamic fusion of sounds that incorporates inspirations from blues rock, theatrical storytelling, and fast-paced rap verse. A big band symphony of horns rages beneath Callison’s alchemical control of rhyme and diction, spitting lines alongside wild piano (played by Callison) and fuzzy electric guitar. Loving the energy and the theatrical vibe of the track. Stream it below! Zach Callison is known for his work as the voice of “Steven” on Cartoon Network’s hit show Steven Universe, his on camera acting as villain Chuck for Amazon Studios' Just Add Magic as well as guest appearances on ABC’s The Goldbergs and CBS’s NCIS: Los Angeles. Music has always been a huge influence— as a kid he watched his father play rock music in the blues bars of St. Louis— an experience that lives on in the sounds he creates today. He's been featuredon a number of soundtracks including the Emmy-winning Sofia the First and Steven Universe Soundtrack: Volume One, the latter of which hit the number one spot on the iTunes charts. No stranger to the stage, he's performed in massive musical theater productions at the St. Louis Muny Theater and cover bands throughout venues in Los Angeles, eventually shifting his focus to songwriting. The sound born from his unique background is a surprising mix of rock hooks, energetic theatrical instrumentation, and hip-hop rhyme schemes that already has his fans excited for the full record. On War!, Callison presents a preview into the storytelling experience he’s crafted throughout his debut EP, A Picture Perfect Hollywood Heartbreak, due out later this year.